Ubonrat dam in Khon Kaen is now increasing discharge from 4 to 5 million cubic metres a day as it is taking in 40 million cubic metres of water daily. The increased water is expected to deteriorate the flooding situation now already suffered by residents living along the banks of Chee river. In the Central Plain, the Pasak Jolasid also reported almost full storage capacity and now is increasing water duscharge, thus could bring more hardship to people living along the Pasak river. In Nakhon Ratchasima, the Friendship Highway is now flooded at two sections in Sikiew district with flood level measuring from 30-80 centimetres. The two locations submerged are at Kilometre markers 93-94 near the weight checkpoint at Lat Bua Khao to CP Industry factory stretching for 500 metres, and at Kilometre markers 96-97. All vehicles are advised not to travel on the two locations. Highway police said even container trucks could hardly pass the submerged section of the highway as the water is as high as the wheels. All vehicles were advised to other roads instead to avoid the two places. The flood on caused up to 10 kilometre traffic congestion on the highway passing the Lamtakong dam in Pak Chong district. 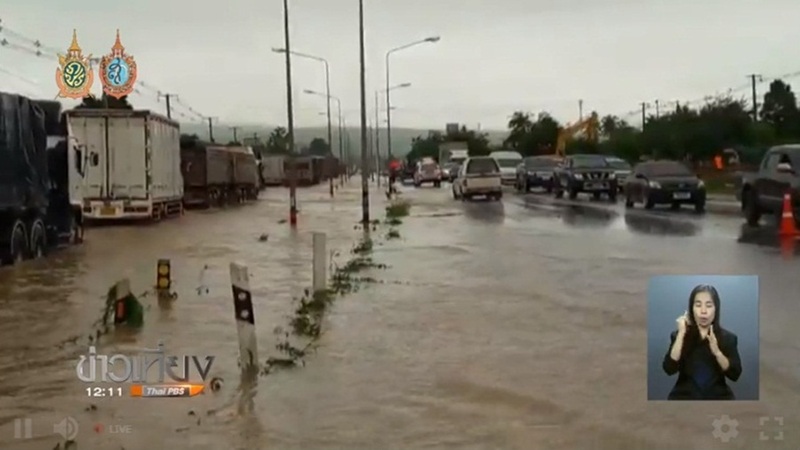 Meanwhile Highway 304 from Kabinburi to Srakaew are also submerged by floods. Small vehicles are advised to keep off the road. In Nakhon Sawan province, the flood situation is similarly bad after a massive body of water from Phetchabun province located upstream flowed into the province and flooded homes and farmlands in 4 sub-districts in Tha Takoh district. Water levels are reported to be continually rising and thousands of acres of rice fields have completely disappeared under flood waters. Four hundred meters of the road connecting Tha Takoh and Nhong Bua districts have also been put under water forcing residents here to bring in back-hoe tractors to dig up the mouth of roadside irrigation ditches so that water can be drained off into the Bueng Borapetch swamps. So far more than 26,000 households in 12 districts in Nakhon Sawan have been affected by heavy flooding.